Over a thousand people like us! Today is a VERY special day because our Facebook Fan Page now has over a thousand fans. What a milestone! They should really mark March 16 as “Academy of Art University School of Fashion Reaches Over 1,000 Fans” Day. Just because we reached a thousand, doesn’t mean we don’t want anymore. 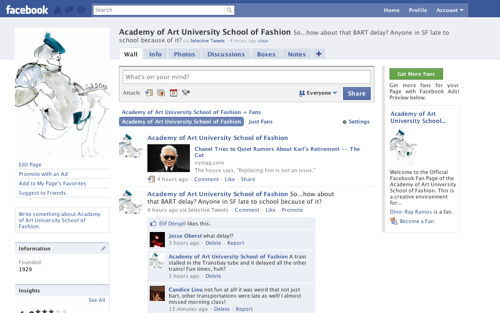 So if you want to keep yourself updated with School of Fashion news and you want to join in on your fashion and pop culture conversation, join our fan page by clicking here – and be sure to tell all your friends that all the cool kids are fans of the Academy of Art University School of Fashion.